G Suite is an ultimate tool for maintaining team communication and cooperation. Working as a team, you have to stay connected with the team in every possible way. A good communication keeps everyone up to date and works according to the milestones and deadlines. Google’s G suite is helping businesses and organizations to stay connected with the team. In this article, you will understand G Suite is Beneficial for Small Businesses. Main features are Compose emails, Forward emails, threaded conversations. Gmail account is the key for your G suite. Platform to schedule appointments, meetings of entire business operations in the real time. Create word files, excel documents, slides and other office files. Make presentations on the go using Google Presentation app so You can also insert images and videos in the presentations. It helps in creating a website for your team instantly. These websites are available on the Google app domain and are easily edited by your team members who are having appropriate permissions. Google voice is reinventing the one phone number concept. If someone calls you on your Google Voice number, they get recorded and you are informed on your register mobile number about the new voice message. Thus G suite includes apps like Gmail, Google Docs, Google Drive, Calendar and many more. G suite applications are helping the businesses in running the projects in a simple and organized way. It contains state-of-the-art tools that help n communication, document creation, files sharing and more. 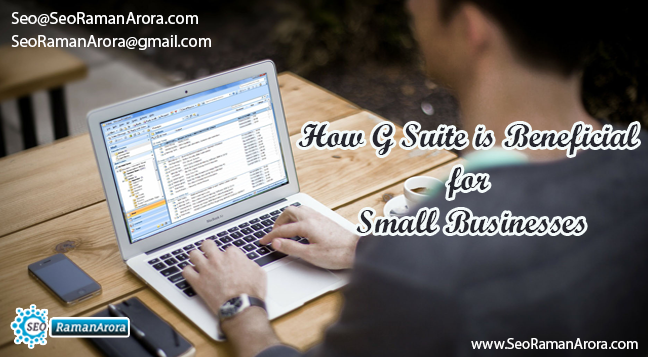 G suite has improved the efficiency of small as well as large businesses to a great extent. G suite allows any of your team members to create documents, spreadsheets, slideshows etc. These are the main building blocks of any project. Notifying every team member about creating and editing the document is a great way to keep the team updated. You can tag team members, assign work to them and follow them on the G suite applications. Communication is the key to any successful business. G suite instant communication app Hangout enables you to chat one to one or group chat with the team member. You can schedule group meetings on the go. A notification will be sent to the team members as an invitation to attend the meeting. G suite applications allow communicating in the form of text messages, audio calls, and video calls. You can share your screen too. With the help of G suite, team members can communicate with any part of the world. Google Drive enables your team to store all the important files, images and documents at one place over the cloud environment. So Any team member who has the access and permission can view, download or edit the documents and files. Google Drive has huge storage capacity. So you can store big files and folders on the Google Drive too. You can count on Google for sharing sensitive and confidential information as Google security system allows only the authorized user to view files and folders. G suite enables you to manage your team’s work report, deadlines, and work progress. The Admin feature of the G suite enables the managers to keep an eye on the work and performance of every team member. The features covered in Admin account are exclusive. For example, adding a new user, removing a user, checking daily work reports etc. G suite provides you everything in one place so that you can analyze the performance and progress at single place. Moreover, Admin is eligible for the 24/7 support from the Google. There are many competitive apps that are available in the market and providing the same functionality as G suite. But none of them can match the ease of access to G suite. G suite pulls everything and brings it one single place. Whether it be Emails, documents, calendar, chats, videos etc. Moreover, Google apps work just perfectly. Therefore Small businesses are definitely gaining a lot from the G suite applications. The G suite apps are secure and are far from any potential threats. Businesses are sharing their information over G suite. So, Google has made sure that the information shared via G suite is secure over every platform. The two-step authentication process makes sure that only the authenticated and authorized users are having access to the files. In conclusion, G suite is a set of real-time applications that are helping small businesses to grow. G suite is an affordable solution for the small businesses to manage daily business operations effectively. If you are thinking to add a cloud-based platform for your business, go with G suite. The modest pricing and bundle of useful applications make G suite the first choice of small businesses. Previous Post:How the REST API Design Process Works?